Vanilluxe in game: 327 Who? Important notice! Pokemon Vanilluxe is a fictional character of humans. Vanilluxe (Japanese: ????? 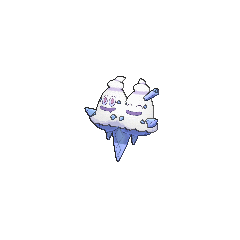 Baivanilla) is an Ice-type Pokémon introduced in Generation V.
Vanilluxe is a two-headed Pokémon covered in a swirled, white substance that resembles ice cream. Each head has two light purple eyes and a slightly darker purple mouth. There are light blue ice crystals to the side of each eyes and two under each mouth. 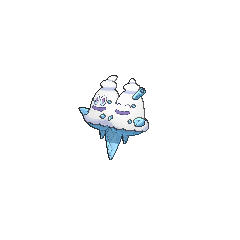 It has two stubby arms and three spikes under its body, all of which resemble icicles. The middle spike under its body is the largest, and there is a hollow, straw-like structure on top of the left head. On the back of its two heads there are many small ice crystals. 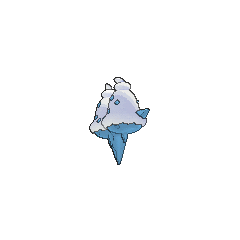 Vanilluxe ingests large quantities of water, which it uses to compose internal snow clouds. When angered, it expels a powerful blizzard. Vanilluxe made its debut appearance in Crisis at Ferroseed Research! under the ownership of Georgia. A Vanilluxe appeared in Thawing an Icy Panic! 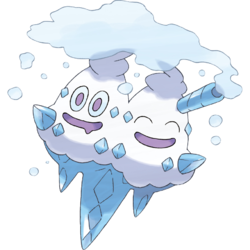 alongside Vanillish, where they were looking for Vanillite who has gone missing and caused a big whiteout in Coumarine City. Alder used Vanilluxe against N, but was quickly defeated. According to Game Freak, Vanilluxe and its evolutionary relatives were drawn by James Turner. 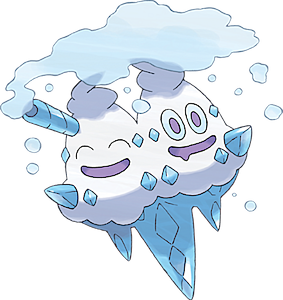 Vanilluxe is based on an ice cream cone with snow for scoops and icicles for the waffle cone. Its boat-like body and two "scoop" heads may indicate a banana split. 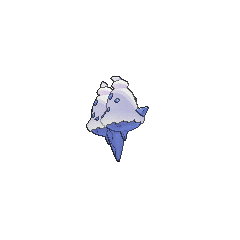 Vanilluxe has bits of ice on it that look like bits of nuts. It also has a straw- or rolled wafer-like appendage, bringing ice cream sodas to mind. Baivanilla may be a combination of bi (prefix meaning two) or ? bai (double) and vanilla.